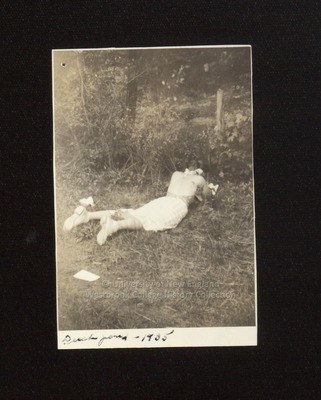 A Westbrook Junior College student lies, studying, stomach down in the grass at Evergreen Cemetery, Stevens Avenue, Portland, Maine, in this sepia toned candid snapshot. She wears a skirt, backless halter top, and white oxfords. Her hair is in two pig tails or braids and tied with ribbons. On the front of the photo is written in dark ink: Duck pond - 1935.